The other day, I decided I would drive home for lunch to save money and to let my dogs out for a midday bathroom break. I live about two miles from my place of employment, thus it is a quick drive. I made a sandwich and went outside to eat on the porch swing while the dogs ran feverishly around the yard in excitement. 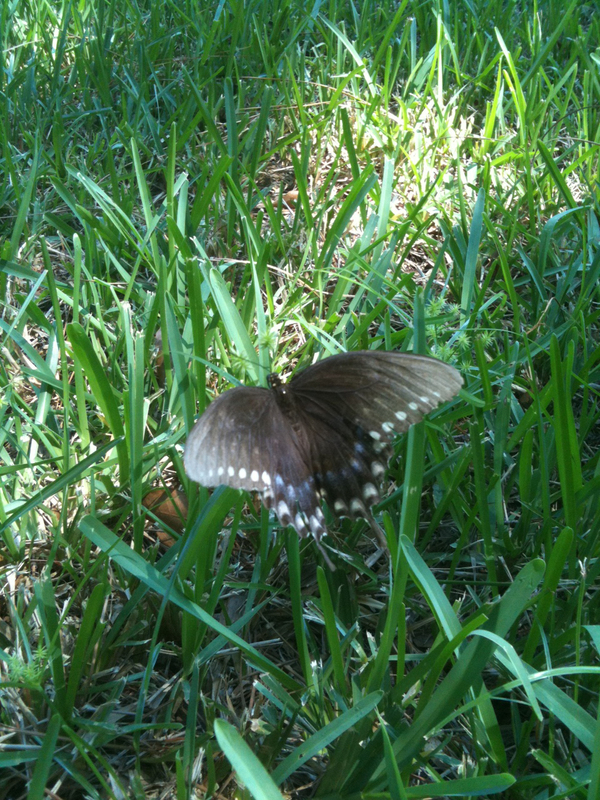 Suddenly, I spotted a gorgeous butterfly sunning itself on the lawn with its wings spread. I was able to get close enough to capture a photo of it on my iPhone. I was thrilled! So, why is this event such an inspiration that it still stands out in my mind? Well, when we least expect it, beautiful things will inspire beautiful ideas. Being the creative-minded individual that I am, I always seek inspiration in the form of natural beauty. It also doesn’t hurt that I am a nature,landscape, and architecture photographer at heart. Thus, here is the challenge that I pose to my readers: take a moment to use your creative mind to find anything in your surroundings that you find inspiring. Then leverage that inspiration to solve questions, problems, issues, and concerns in your daily marketing efforts. I bet you, too, will find doing so to be successful. Below is a YouTube video of young Ms. Maria Aragon singing Lady Gaga’s a cappella rendition of “I was Born this Way.” I understand that this message is echoed across the world, yet we truly do not listen to the message. Let us take a moment to listen to this young, talented lady sing the message from her heart. I hope you enjoy it as much as I did.